I am going to be in the woods for 5 days! Ok, let me back up. Last year I went with my sister, mom, and dad to a little event called the Suwannee River Jam. It’s four nights of various country artists performing and a WHOLE lotta fun! Attendees can primitive camp or stay in RVs. Since my dad has an RV, we’ll be going that route. 🙂 We had such a good time last year that we decided to go again this year! Unfortunately, internet and cell service is a little spotty when you’re out in the woods like that, so I’m taking an official blog hiatus for the next five days. I should be back either Sunday or Monday for a food i 8 post. I’m excited for all the country music, family time, relaxation during the day, catching up on some reading, good eating, and even a little drinking! 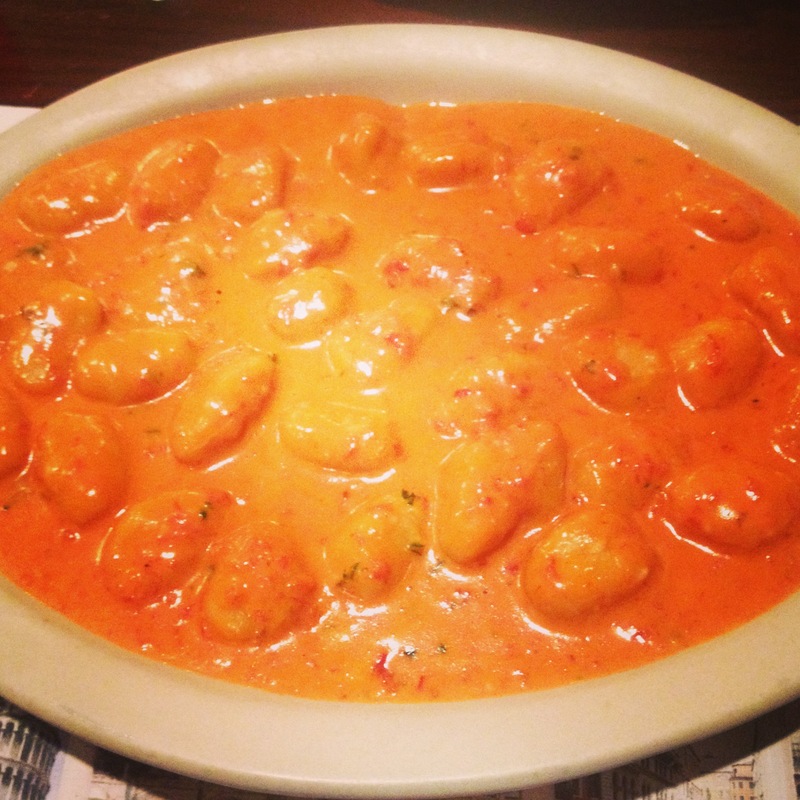 There will be no scales or calorie counting on this trip–just good times. So, I’ll definitely let loose a little, but I will try not to get too out of control. I’ll report back after my return! Oh, and here’s a quick recap of the food i 8 today. 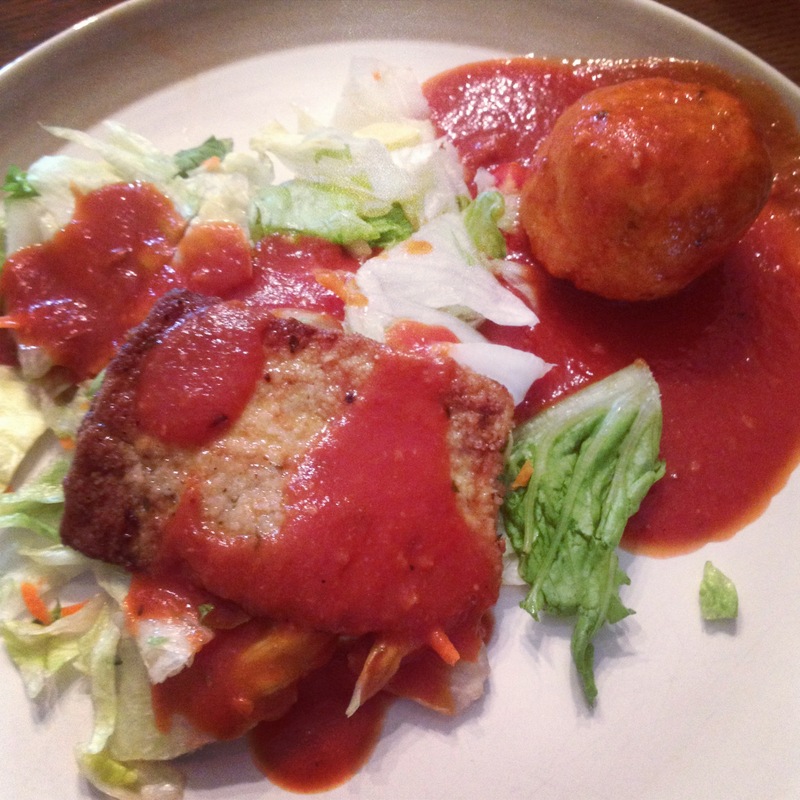 Breaded eggplant over mixed greens with a cheese “meat” ball on the side, all topped with my dad’s amazing pasta sauce. Then I had a second plate of this! Then I had two slices of garlic bread. 🙂 I sooo wanted dessert again tonight, but this is my LAST day of the week of no dessert, so I’ll definitely be back at it tomorrow! 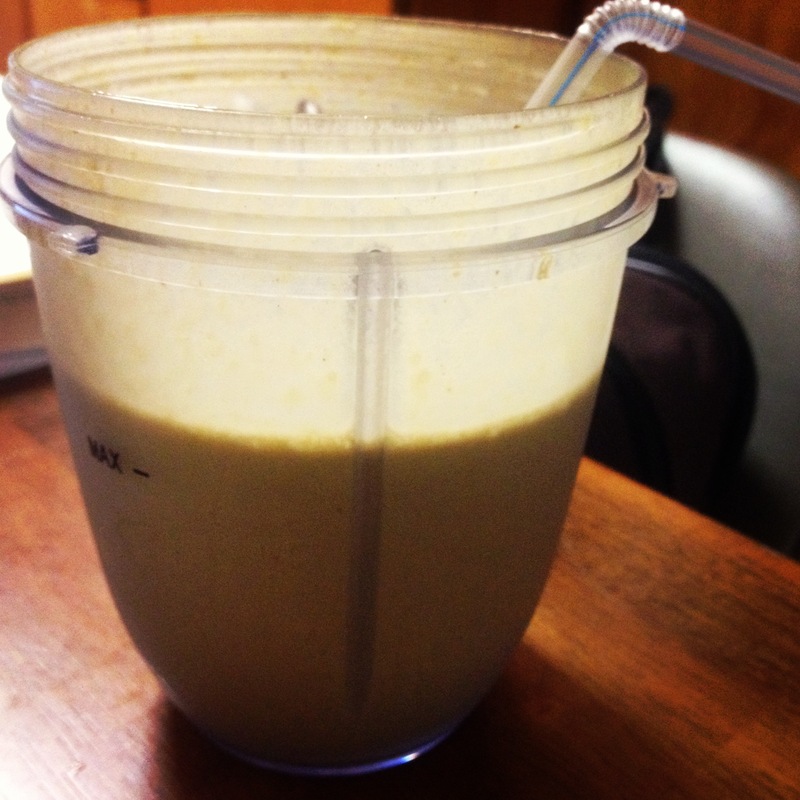 A little while later, I whipped up my favorite protein shake. 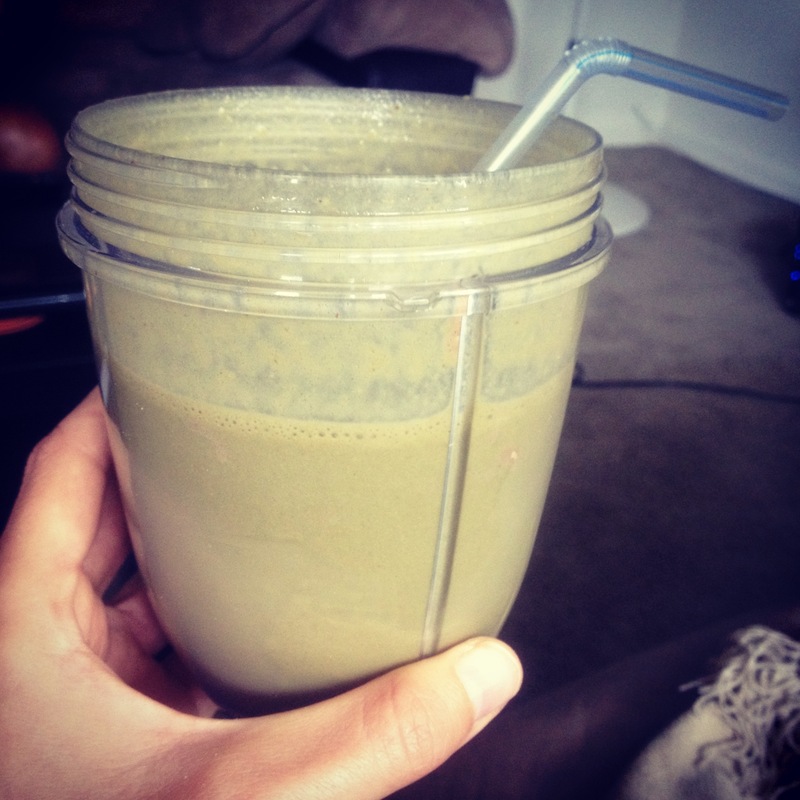 I love that this recipe ensures I get some fruit, green veggies, protein, calcium, and healthy fat in my diet. It has a little bit of everything. We ran some errands this evening, including a trip to the Apple store in the mall. We grabbed an early dinner around 5pm at a place called Burger 21. It’s very close to the Mall at Millenia, so we’ve checked it out before and I felt just “eh” about it, but since we were in the area, we decided to give it a second chance. 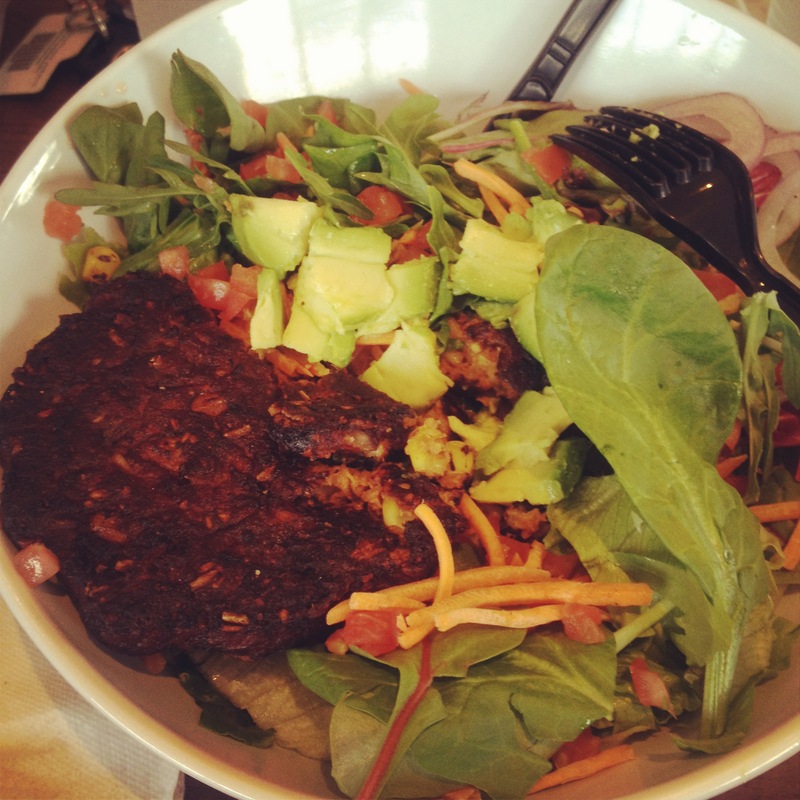 This time I ordered a black bean burger patty over a salad. Again, I just felt “eh” about it. It isn’t bad or anything, it’s just mediocre. I much prefer the veggie options at BurgerFi or Graffiti Junktion or Pine Twenty2 when I’m in Orlando, but I suppose I would go here in the future for a burger fix if I need it. Later in the evening, I had SUCH a dessert craving, but thankfully I had some pizza left over from the other night to satisfy my munchies. Today we took an hour long drive to meet my sister and my three nieces for some fun in the sun. We hung out at the pool for roughly four hours and just played and basked in the sun. It was a good time! 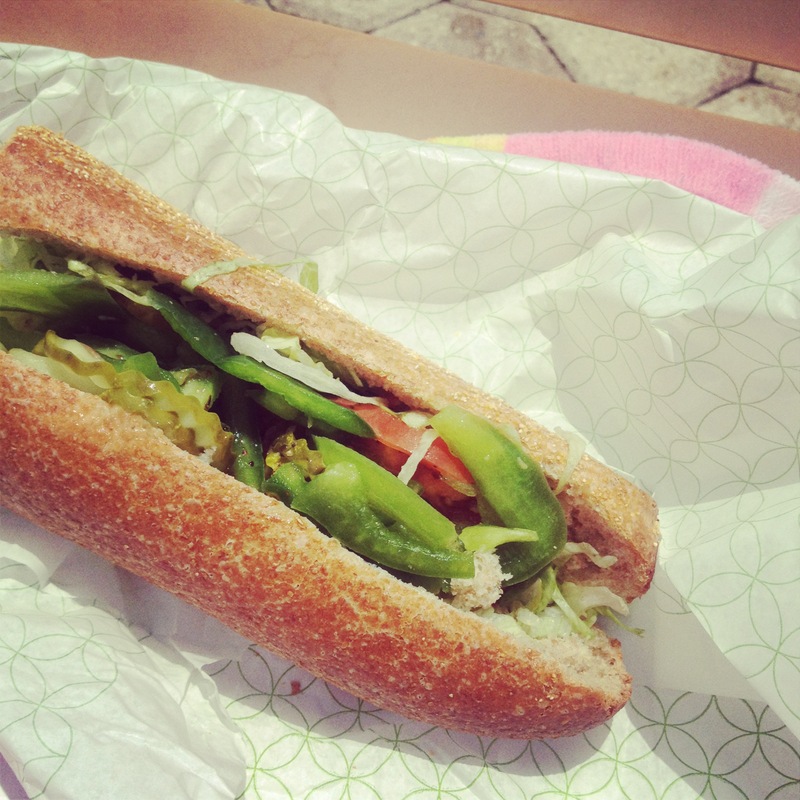 We brought Publix subs to the pool for lunch. 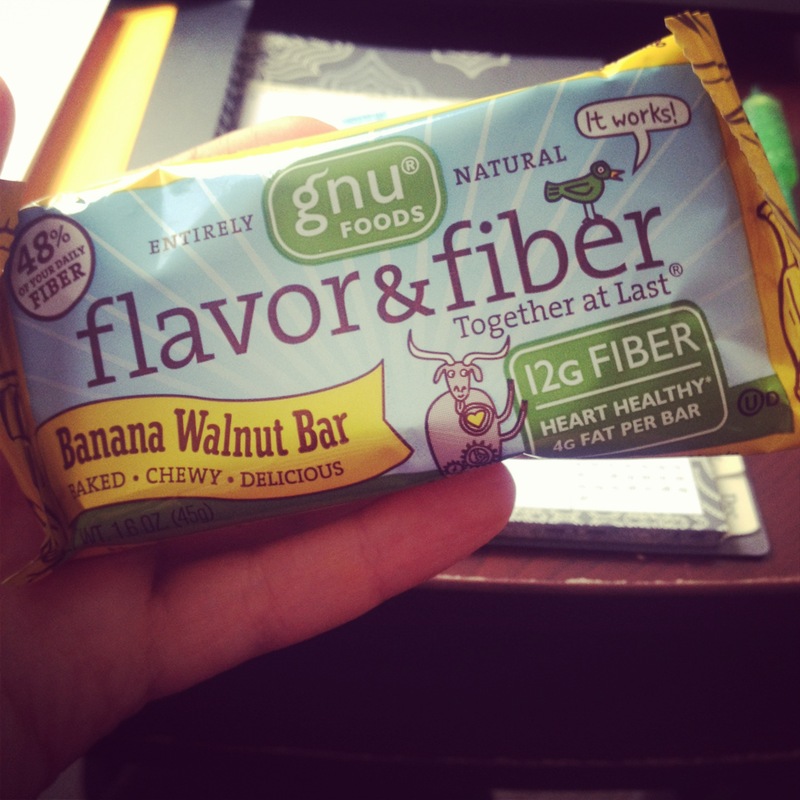 I also snacked on some dried pears and some of a gnu foods banana walnut fiber bar. We stopped at a southwestern type place for dinner on the way home. 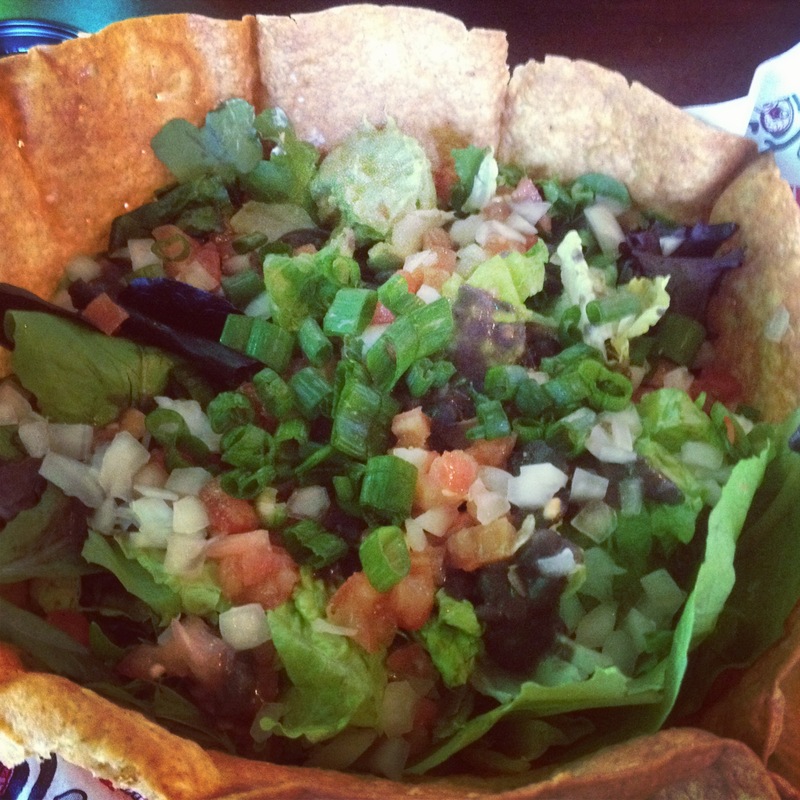 I went with a black bean salad in a whole wheat tortilla shell. Good stuff! That’s about it for today–hope everyone had a great weekend! busy day full of good eats! Workout: none. quite a bit of walking though! We slept in a little today and then watched a couple episodes of another Netflix original series called “Hemlock Grove”. It’s a little strange. They’re definitely trying to tap into the vampire/werewolf craze with this one. It’s nowhere near as amazing as “House of Cards”…just sayin. 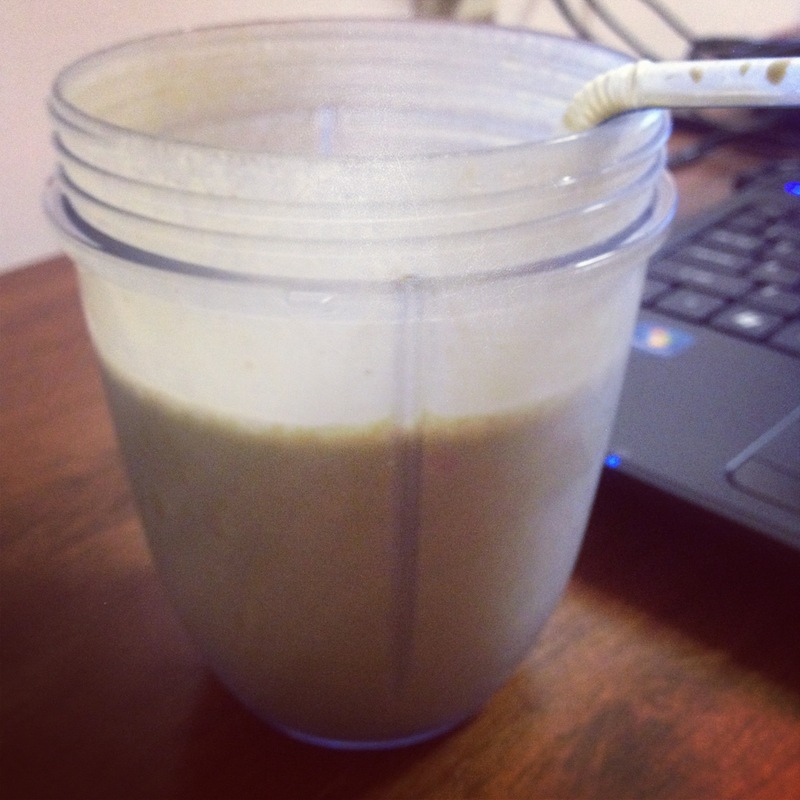 After being lazy for a while, we had a couple errands to run, so I whipped up a shake before we left the house. Then we were off! We stopped for lunch at a mall food court. 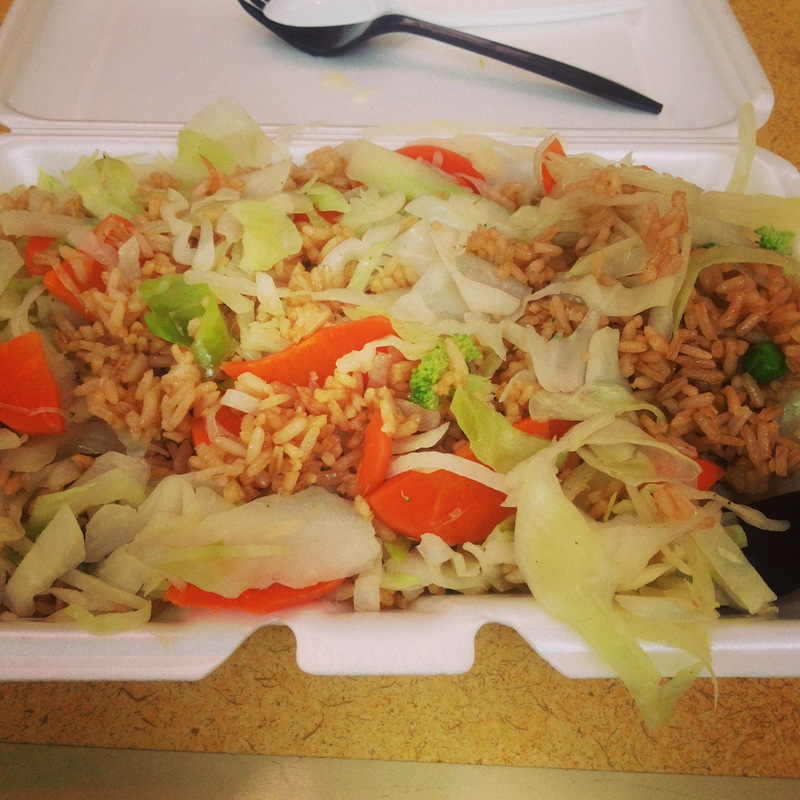 We decided on a Japanese place, and I ordered a veggie & fried rice meal. I ate about half of it. After our errands we decided to go see a movie at a cheap theater in town. We saw The Incredible Burt Wonderstone. It was eh. It had some funny moments, but it wasn’t hilarious or anything. 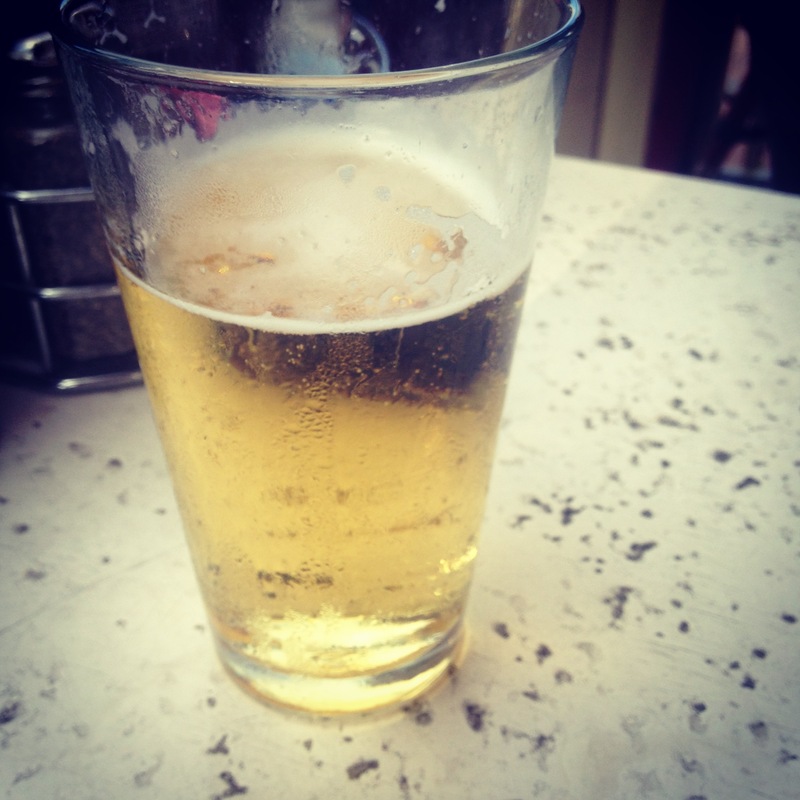 After the movie, it was happy hour time! 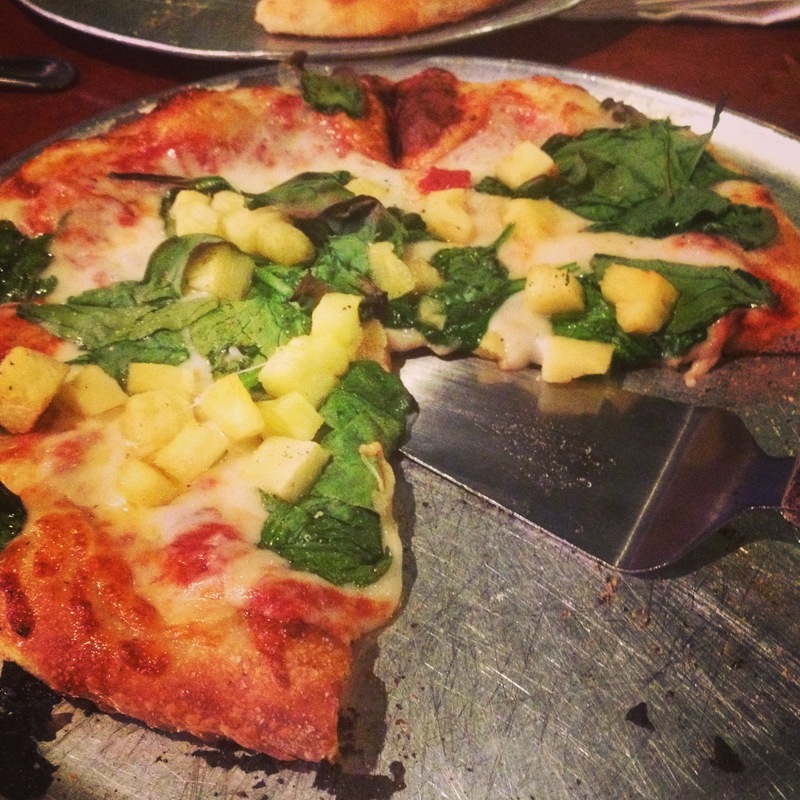 We worked up an appetite and decided to hit up a local pizza joint for dinner. 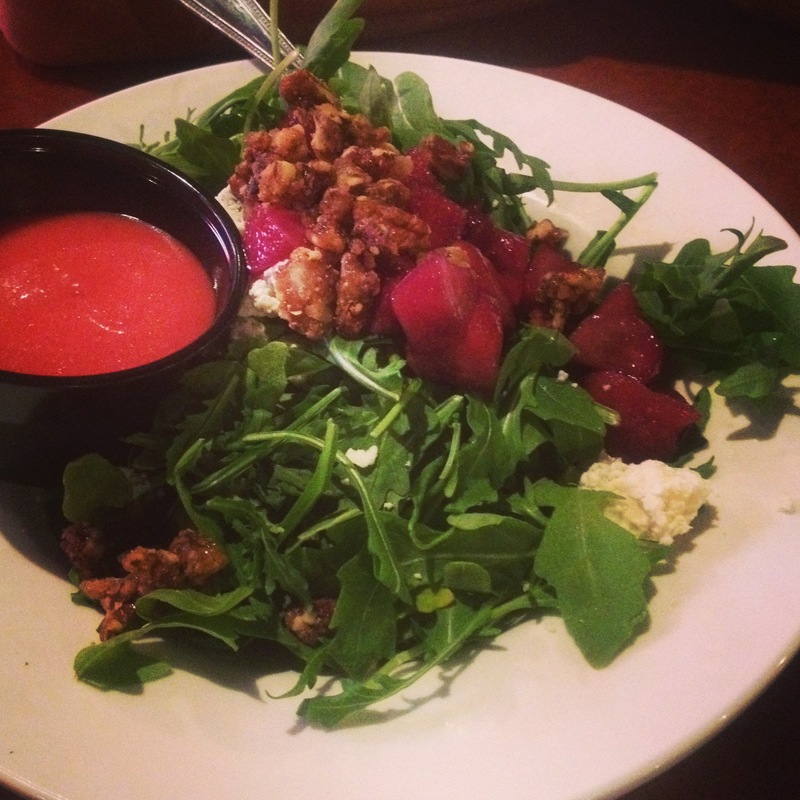 I started with an awesome salad with arugula, pears, gorgonzola, and pecans. 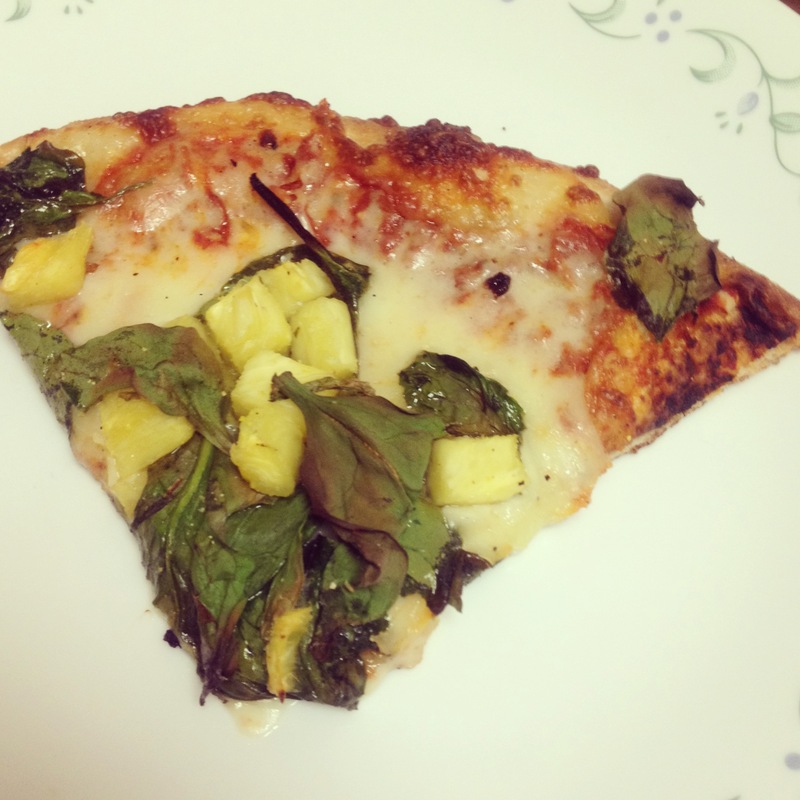 For my meal, I went with a personal 8″ cheese pizza with pineapple and spinach toppings. Yum! I ate half of the pie (two slices) before I called it quits. I felt like we were eating/drinking all day long, so stick a fork in me, I’m DONE at this point! Granted, it’s only a week (I started on Wednesday). That’s not even close to an alcoholic giving up alcohol for LIFE, but I figured since I’ve been way overdoing it on the dessert front (as evidenced by posts like dessert trio, disappointing dessert, sugar overload, and free ice cream!? ), I’d say it’s also probably best for my health to lay off dessert for a week. Okay, onto today’s eats! 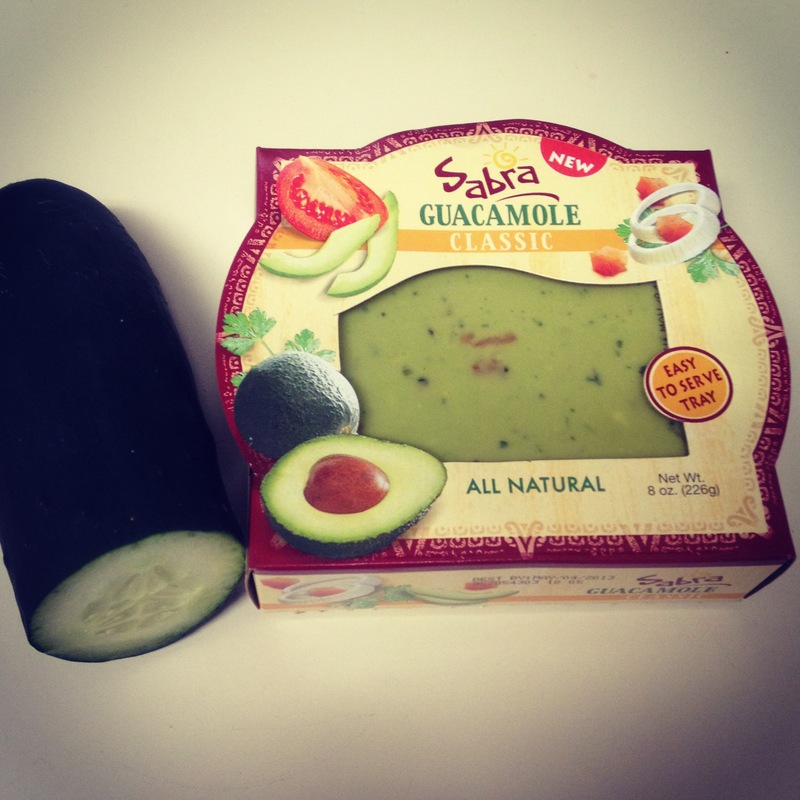 I started with some cucumber slices and the rest of that Sabra guacamole. Good stuff! I had to go to campus for a presentation from about 2:30-4pm, and then I hit the road for Orlando again! I have two weeks until I start teaching a 6-week summer class here at my university, so I’m taking advantage of some vacation time before that starts. 🙂 I had a little snack before the presentation. And another little snack after the presentation. I’ve been craving some Italian for about a week now, so we decided to check out a new to us place tonight for dinner in Orlando (Il Pescatore). We started with salad (house dressing on the side), garlic bread, and a glass of house red wine for me. 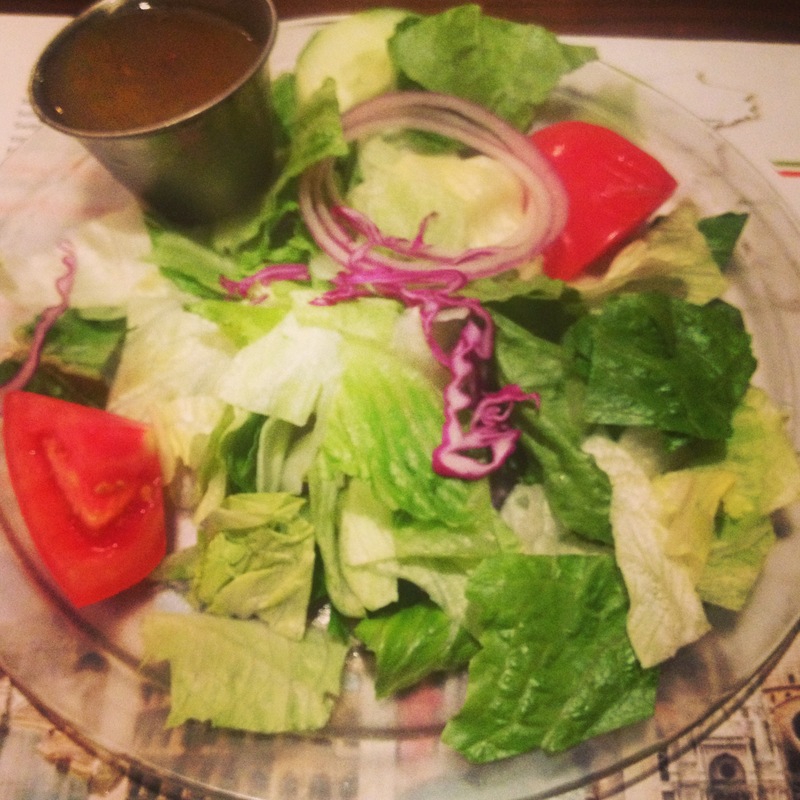 The salad and bread were just “eh”, but my main dish was nothing to sneeze at. 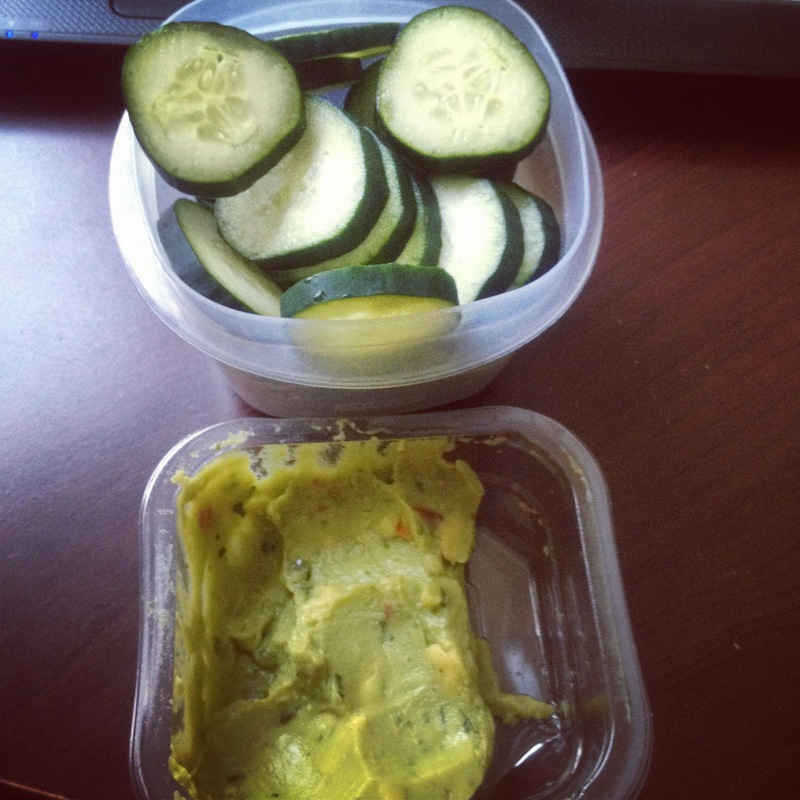 I started my day with a Body Pump class and a post-workout snack of 1/2 a cucumber and some Sabra guacamole. So the other day I was in Marshalls, and as I usually do in this store (as well as TJ Maxx and Ross), I perused the food aisle in the back for some fun, healthy snacks. I came across a box of gnu foods fiber bars. I finally got around to trying one today. Delish! There’s lots to love about these babies: (1) nearly 1/2 your daily fiber, (2) no artificial anything or preservatives, (3) an ingredient list I can read, (4) no added sugar, and (5) great taste and a nice, chewy texture. I would definitely buy these again. 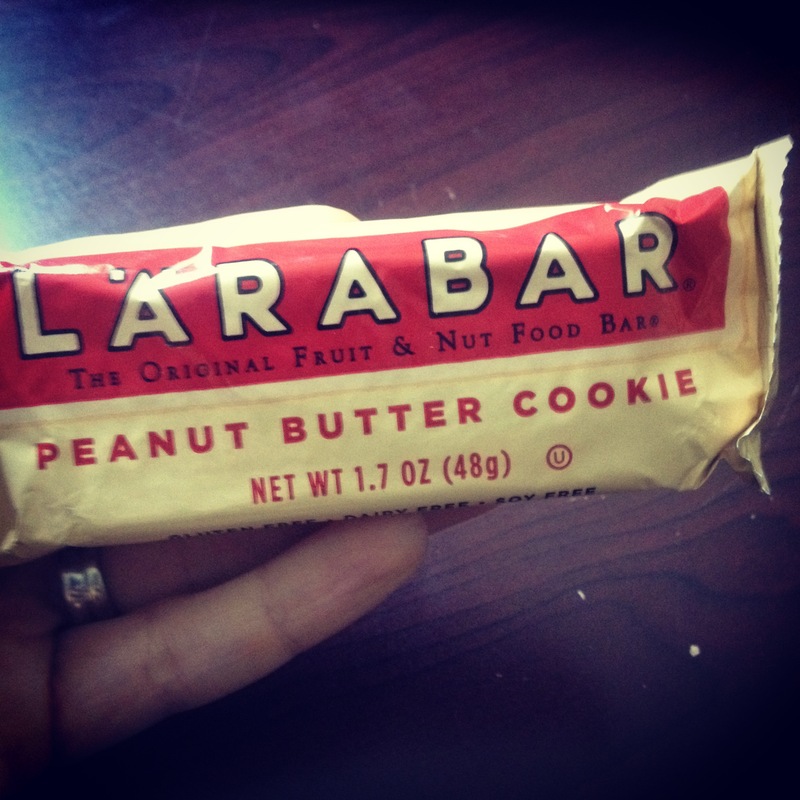 I gave one to the hubs to try as his snack at work, and he agreed it was pretty tasty. Win! 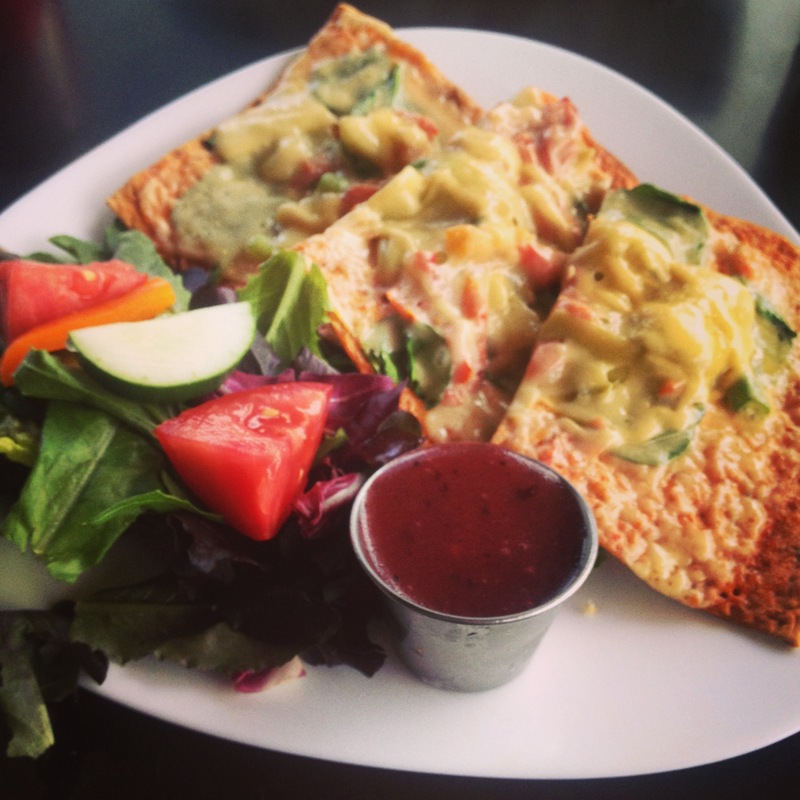 I grabbed dinner with a few of my gal friends at a local vegetarian joint. I went with a veggie burger patty made from eggplant, topped with tomato, provolone, and avocado. It was amazing! I also had a side salad and just the top of my whole grain burger bun. We ended up staying there chatting from 6:30-9pm, so when I got home I brushed my teeth to avoid any unnecessary snacking. Dinner sure filled me up! I got up at the crack of dawn (after a night of terrible sleep) to drive aaaaalll the way back to my apartment. I was quite sleepy, so I thought a quick fast food stop might perk me up. I opted for Mickey D’s! 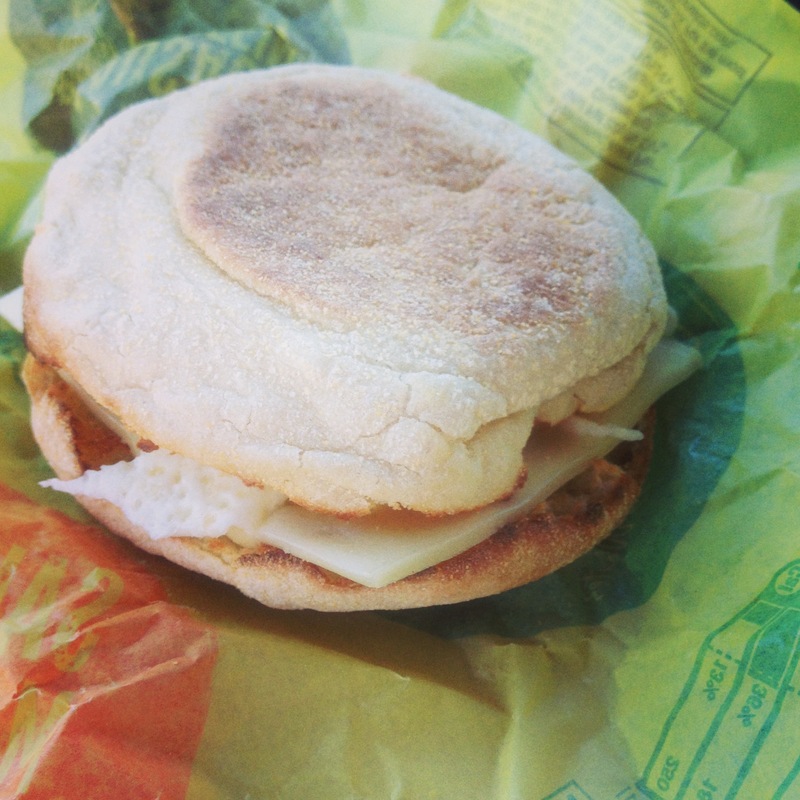 They have a new egg white Egg McMuffin sandwich I’ve noticed advertised, so I decided to try it (sans the Canadian bacon). It was pretty darn tasty! I would definitely get this again when in a pinch or on a road trip. I had a meeting on campus around lunch time, and they provided good ol’ Papa Johns pizza. I ate two slices of the spinach alfredo. Not my first choice, but it was the only veggie option, so I went with it. Tonight I stopped by the Fresh Market to pick up something for dinner. 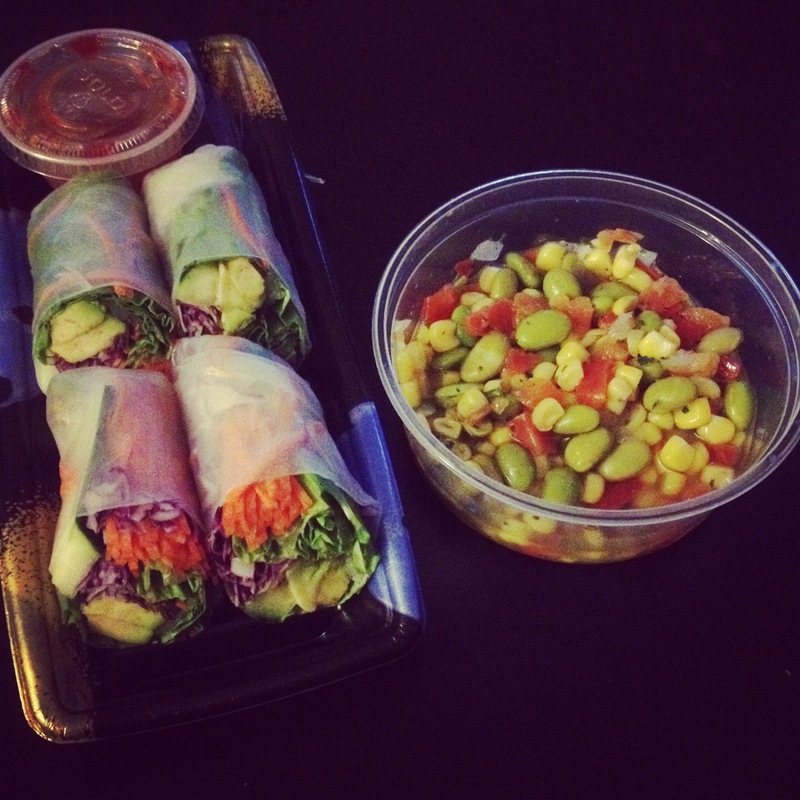 I went with some vegetable rolls and 1/4 lb. of some “edamame succotash”, as it was labeled in the deli. 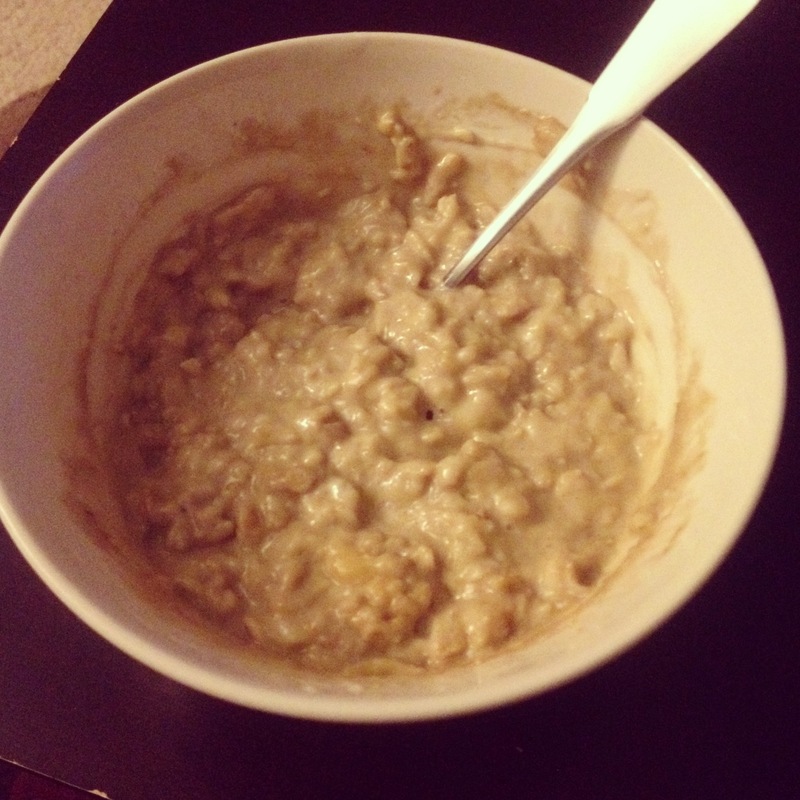 Afterward, I was still a little hungry so I whipped up a bowl of oatmeal that included old fashioned oats, sunbutter, and banana. Yum! Today I woke up, did some work, then headed out to our fave Orlando BBQ joint (4 Rivers Smokehouse) for lunch with the hubs! 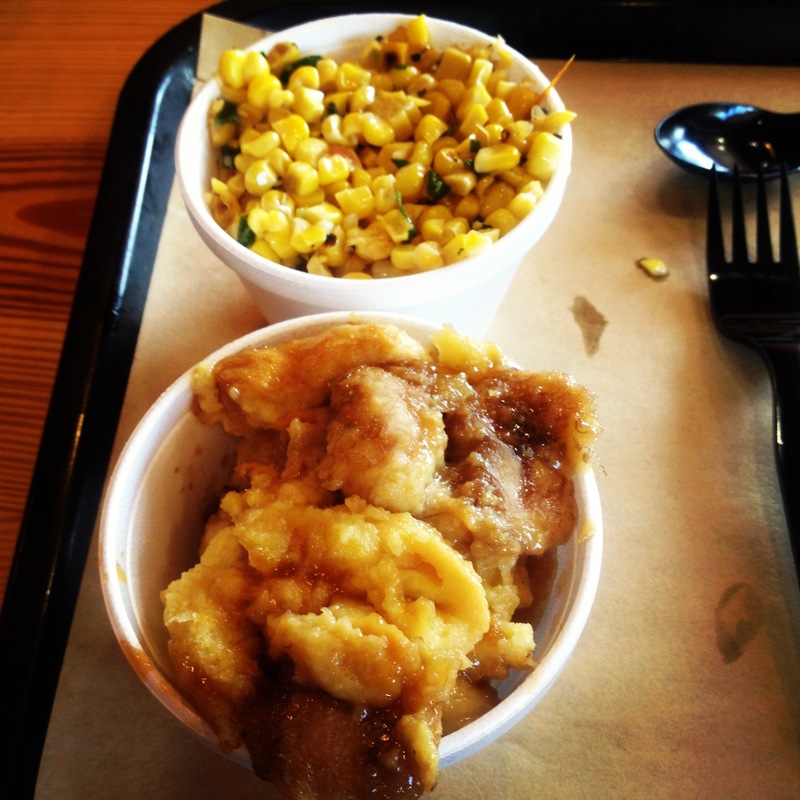 I went with my usual–a side of fire roasted corn and a side of bread pudding. SO DARN GOOD! I ate only half at the restaurant since we ate around 11am, and I wasn’t particularly hungry yet. I ate the other half later in the afternoon. On the way home from lunch, I stopped by my favorite Orlando spot for vegan and gluten-free desserts–Drunken Monkey. I’ve been addicted to their Anzac biscuits for a while, but I decided I wanted to switch it up and try something new. I could NOT decide on just one item, so naturally I went with three. 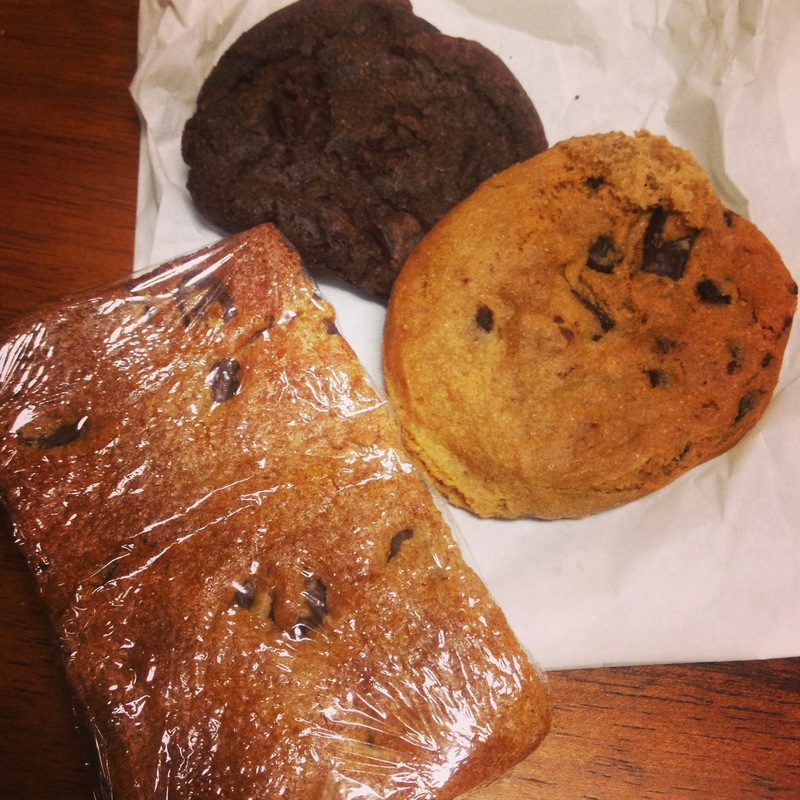 (1) a vegan and gluten-free chocolate chip cookie bar, (2) a small gluten-free double chocolate cookie, and (3) a small gluten-free chocolate chip cookie. After I ate the rest of my BBQ sides this afternoon, I decided to do a little taste test and commit myself to NOT polishing off all three, especially if they didn’t taste good. The result: the cookies were not so great, so I trashed both of them. The cookie bar was delish, so I saved the rest for my after-dinner snack. Perfecto! 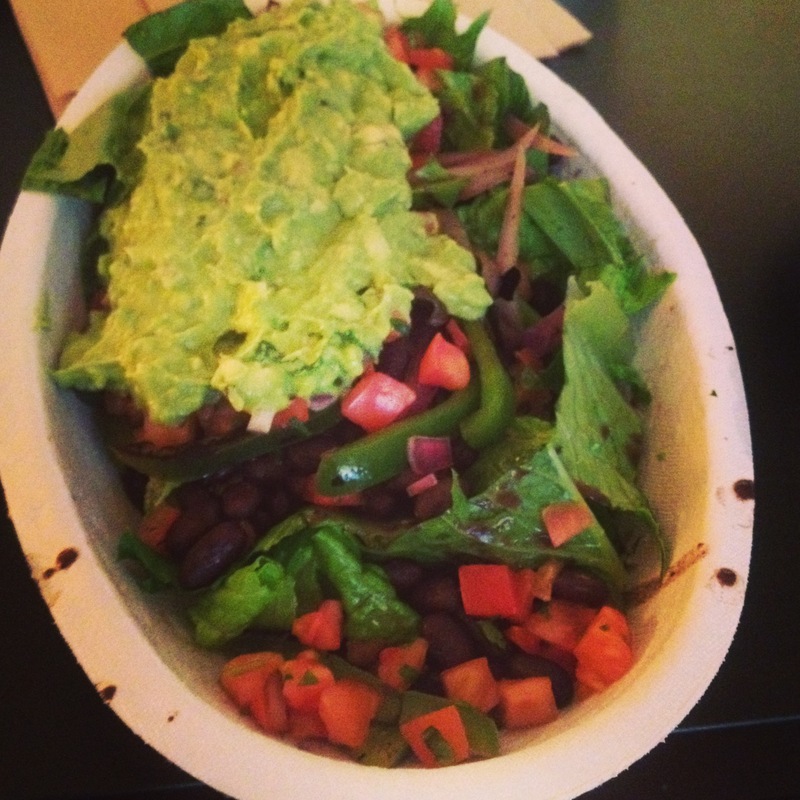 Dinner was a Chipotle salad. I really didn’t need to eat all of this, but I did! My belly is FULL and happy now! I did some work this morning and then went on a short jog/walk in the early afternoon. My foot is sore from all the walking this weekend, which is frustrating! I guess this means it’s not completely healed. I think I’m going to rest it again…or at least try to not be on it as much. 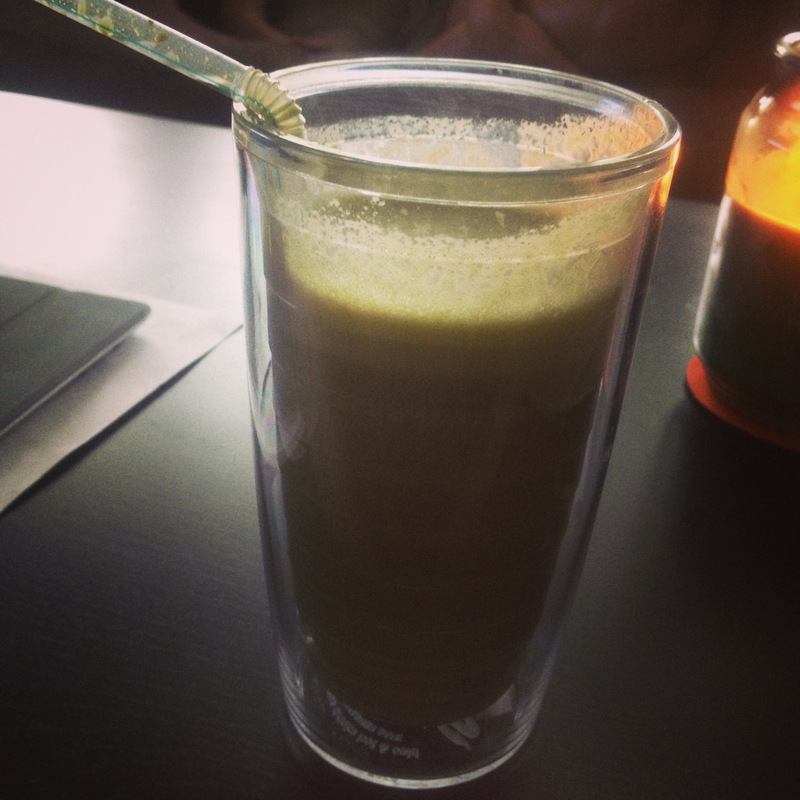 First up on the food agenda was my go-to protein shake. 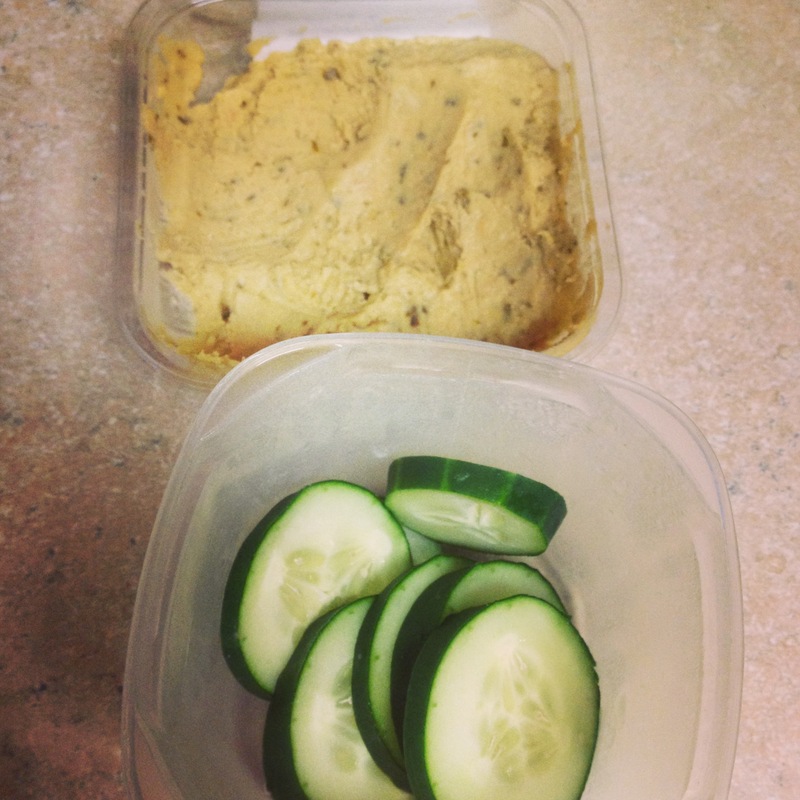 After this I had a snack of some vegetable chips, as well as cucumbers and hummus. 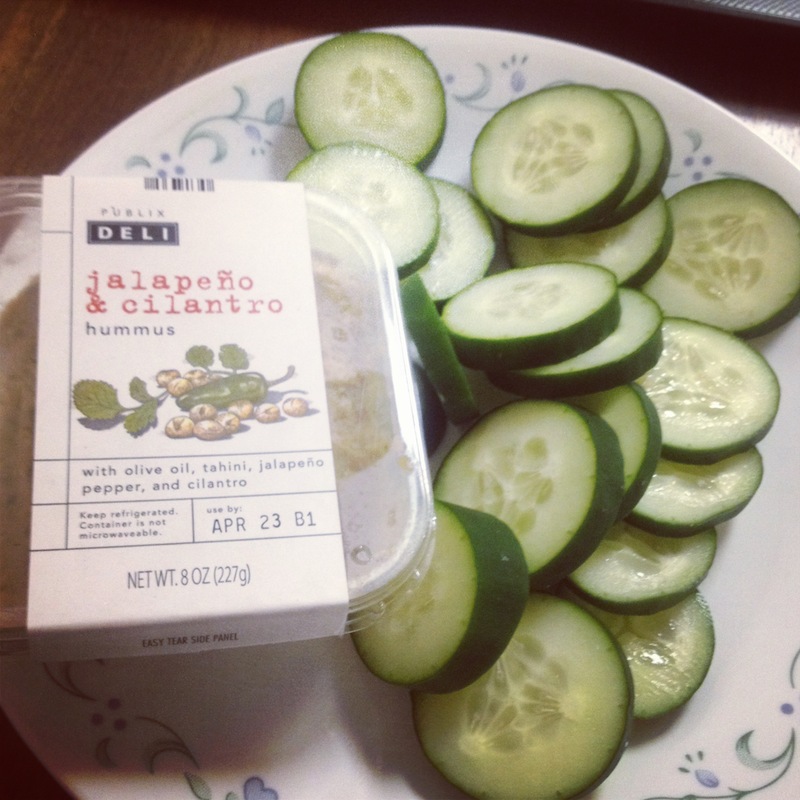 I ended up eating only half of those cucumbers…I thought I could do an entire one, but I didn’t make it. Dinner was one of our Orlando faves–BurgerFi. 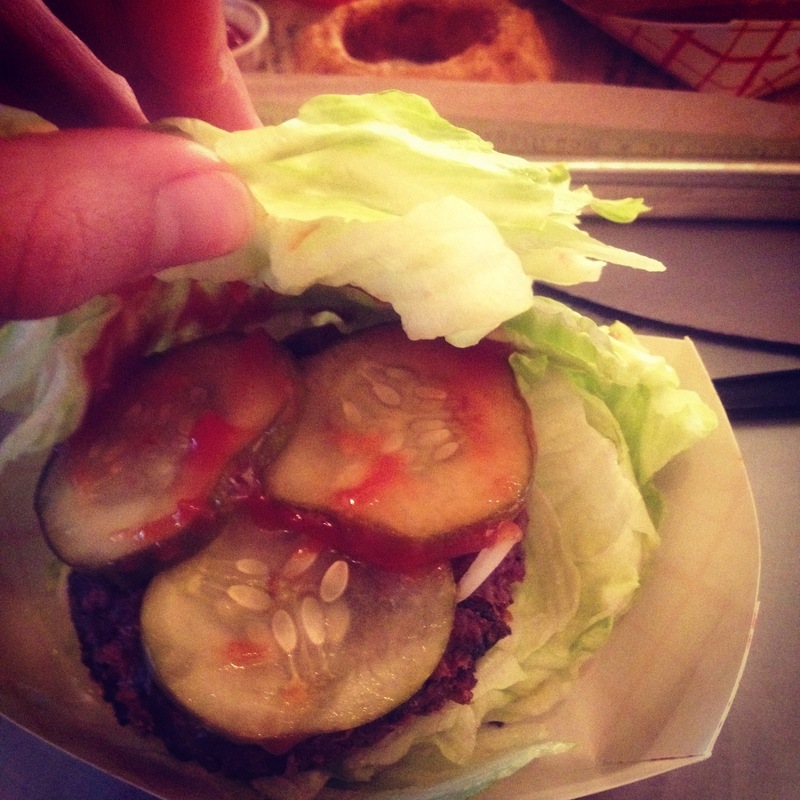 I went with my usual quinoa burger (no cheese) on lettuce wraps in lieu of a bun. 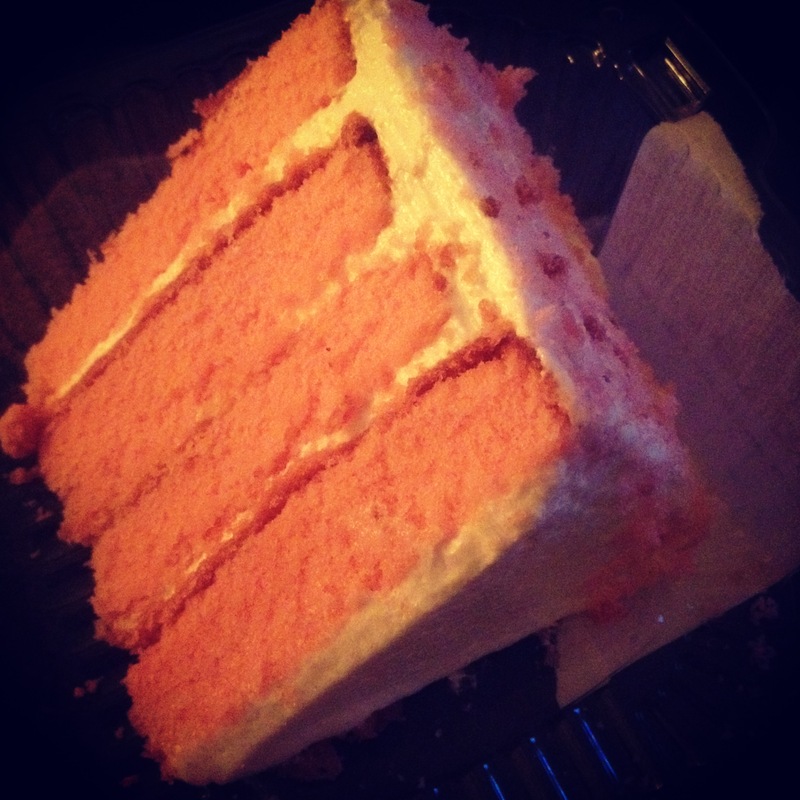 Dessert came in the form of a Publix strawberry cake with buttercream frosting. It actually wasn’t as satisfying as I anticipated. I shouldn’t have eaten it. It wasn’t that great. I’ll remember that for next time! Workout: Does an hour walk around Ikea count? 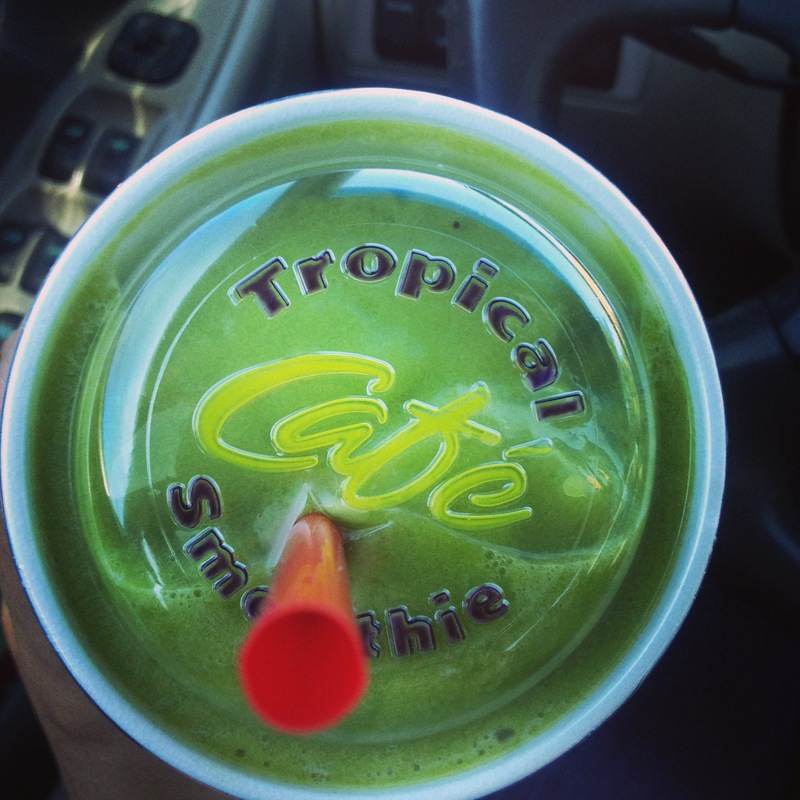 Today started with a late wake-up and a protein shake. It was a dark, rainy day, so we drove around some neighborhoods in Orlando and then headed to Ikea for a bit. 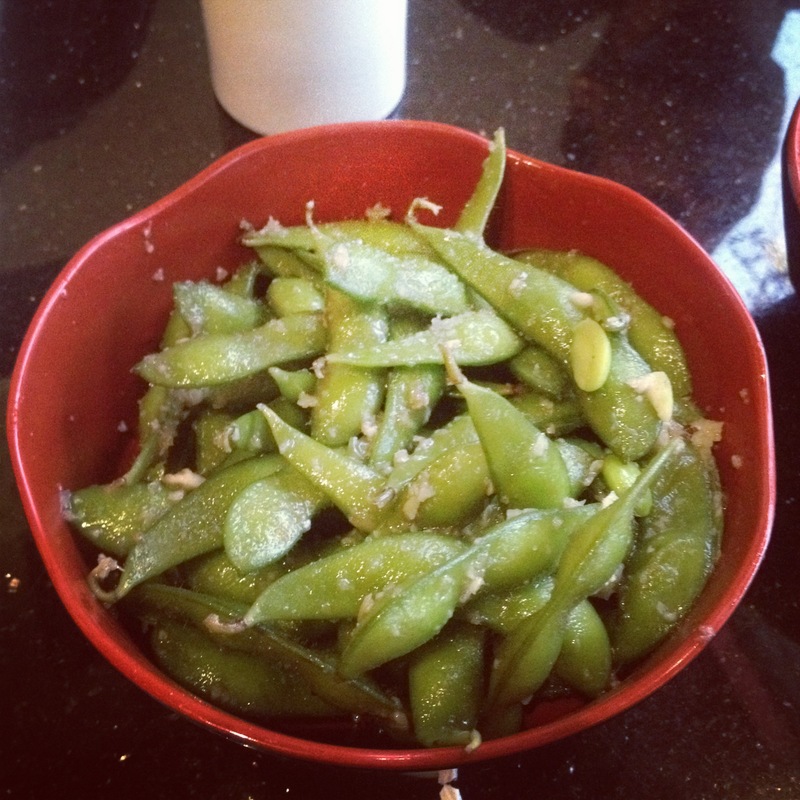 We had an early dinner at a place that considers themselves “Pan-Asian.” We started with some garlic edamame. 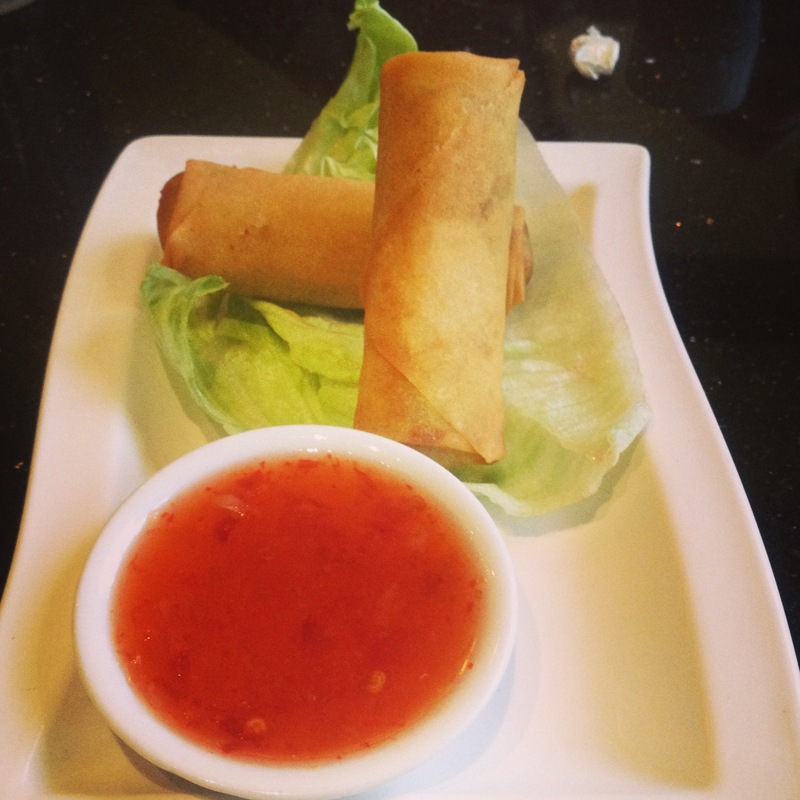 I also split these veggie spring rolls with the hubs. 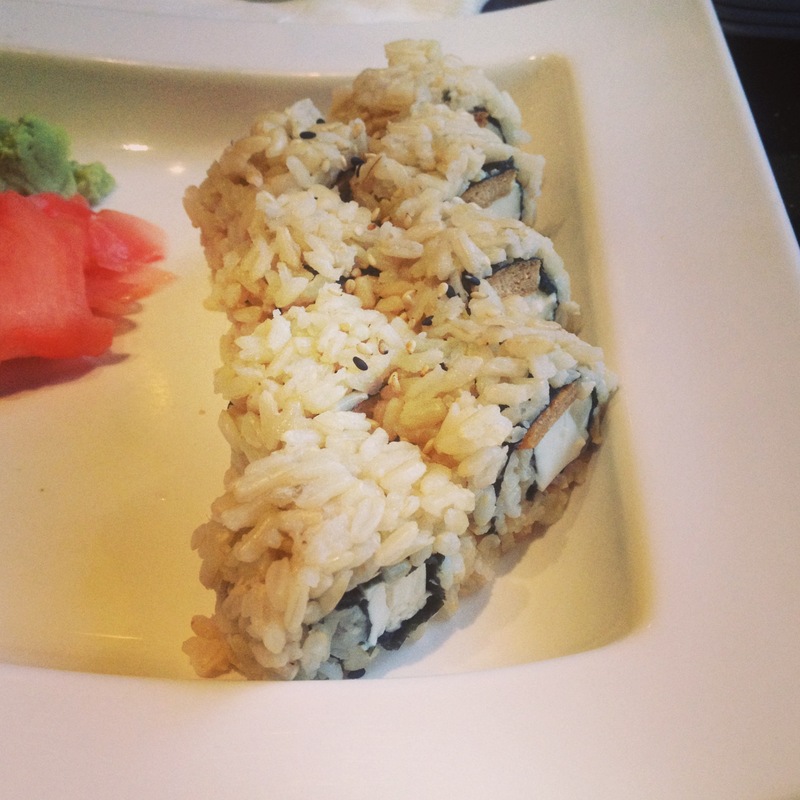 I went with a brown rice tofu roll for my meal. It actually was a little disappointing, unfortunately. 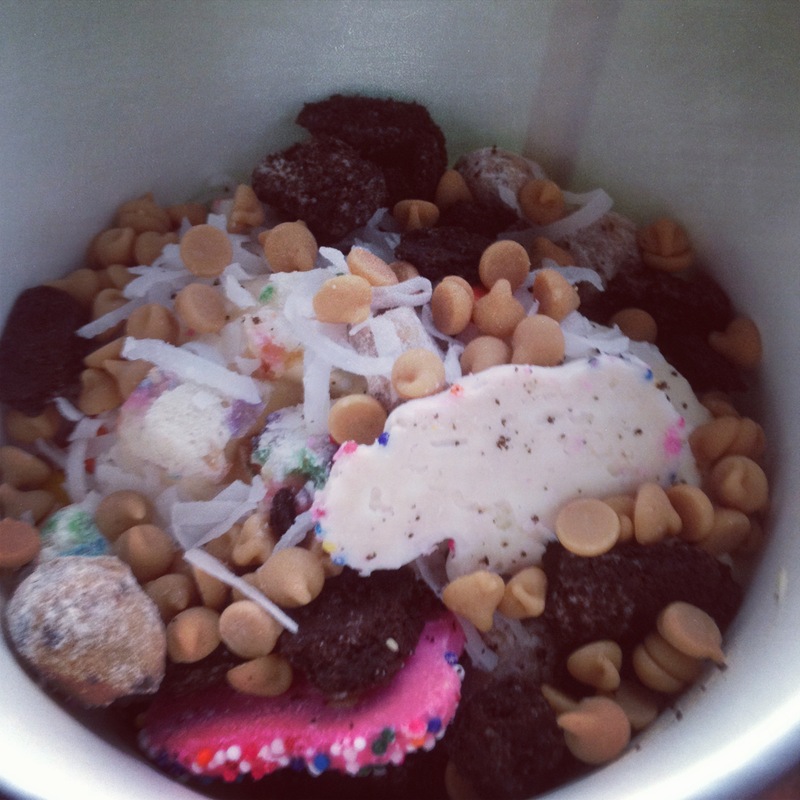 Thankfully, we stopped by a frozen yogurt joint on the way home!